In a recently published paper we have systematically investigated the radio spectral energy distributions of 441 radio pulsars, observed with the Parkes telescope in Australia. The publication can be accessed online via the Astrophysics Data System. This work is significant, because it considers about one fifth of the currently known population of pulsars, allowing us to study their spectral properties in a statistical sense. We also investigate the so-called gigahertz-peaked spectrum pulsars, a small class of sources, which are a hot topic at the moment. Since a few days, the measurements from the paper can also be downloaded in machine-readable form from the VizieR database at CDS. Please find below the abstract of the paper and one of the 441 spectral plots as an example. We present a study of the spectral properties of 441 pulsars observed with the Parkes radio telescope near the centre frequencies of 728, 1382 and 3100 MHz. The observations at 728 and 3100 MHz were conducted simultaneously using the dual-band 10-50 cm receiver. These high-sensitivity, multifrequency observations provide a systematic and uniform sample of pulsar flux densities. We combine our measurements with spectral data from the literature in order to derive the spectral properties of these pulsars. Using techniques from robust regression and information theory, we classify the observed spectra in an objective, robust and unbiased way into five morphological classes: simple or broken power law, power law with either low- or high-frequency cut-off and log-parabolic spectrum. While about 79 per cent of the pulsars that could be classified have simple power-law spectra, we find significant deviations in 73 pulsars, 35 of which have curved spectra, 25 with a spectral break and 10 with a low-frequency turn-over. 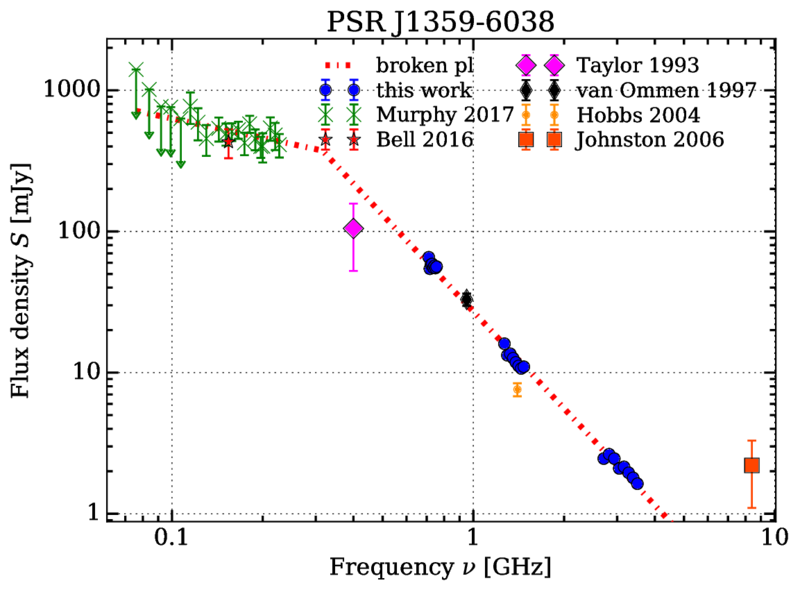 We identify 11 gigahertz-peaked spectrum (GPS) pulsars, with 3 newly identified in this work and 8 confirmations of known GPS pulsars; 3 others show tentative evidence of GPS, but require further low-frequency measurements to support this classification. The weighted mean spectral index of all pulsars with simple power-law spectra is -1.60 ± 0.03. The observed spectral indices are well described by a shifted log-normal distribution. The strongest correlations of spectral index are with spin-down luminosity, magnetic field at the light-cylinder and spin-down rate. We also investigate the physical origin of the observed spectral features and determine emission altitudes for three pulsars.